For some, winter is the best season in the Lake George Region for outdoor activities. While it's tempting to spend a lot of time outside, the cold winter weather is potentially dangerous for anyone who isn't fully prepared for the low temperatures. Frostbite and hypothermia are two of the most common medical problems caused by exposure to the cold. If you want to avoid both this winter, then you should follow the proper preventive measures as well as know the signs of them. Dress in loose, light, and comfortable layers. You should have a moisture-wicking material for the first layer, an insulating material for the second, and then a waterproof or windproof layer on top. Protect your feet by wearing wool socks and winter boots. Wear a pair of moisture-wicking socks for extra protection. Wear insulated gloves or mittens to protect your hands. Stay hydrated. Dehydration increases the risk of both, so alcohol should also be avoided if you plan on being outside for a period of time. Even if you dress warmly for the winter weather, frostbite and hypothermia are still a possibility if the temperature is too cold or if you are outside too long. As such, you should know the signs of both and be prepared for the proper treatment. Frostbite is the most common freezing injury, which is damage to the skin and underlying tissues caused by exposure to extreme cold. It is more likely to occur on fingers, toes, the nose, ears, cheeks, and the chin. If you notice frostbite early and take action, there will be less of a chance of permanent damage. Frostnip - Frostnip is the first and most mild stage of frostbite. In this stage, your skin will turn a pale red and feel cold. Further exposure to the cold will create a prickling and numbness in the area with frostnip. Frostnip typically won't damage the skin permanently. Superficial Frostbite - This is the second stage of frostbite, and during it, your skin will turn white or pale. While your skin will remain soft, it may soon feel warm. If you treat superficial frostbite by rewarming the skin, it may start to look blue or purple and sting. This may cause a blister to form. Severe Frostbite - Also called deep frostbite, severe frostbite is the most dangerous form. This type affects all layers of the skin, and you may feel numbness, lose all feeling in the affected area, and your muscles and joints may feel weak. After rewarming, large blisters will form one to two days later, and then the area will turn hard and black. If you suspect you have frostnip or mild frostbite, it's recommended to rewarm the affected area. However, if you believe you have superficial frostbite or severe frostbite, it's recommended to see a doctor or go to an emergency room to minimize tissue damage during the rewarming process and receive pain medicine. If you can't go to either immediately, then you should start to rewarm the frostbitten area, although it will be painful. Get out of the cold and head to the nearest warm shelter. 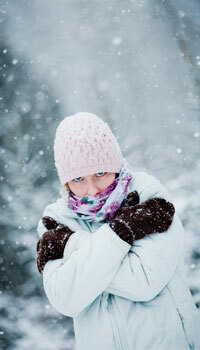 Remove wet clothes, tight jewelry, and check for hypothermia (see signs of hypothermia below). If you can get medical help fast, loosely wrap the frostbitten area in sterile dressings. If not, then use rewarming first aid. Rewarming involves soaking the affected area in warm water (not hot) for 20 to 30 minutes. Use a warm cloth for ears, nose, and cheeks. The recommended water temperature is between 104 degrees F to 108 degrees F. Maintain the rewarming process, and wet the cloth again if you have to. Although burning and color changes to the skin may occur, rewarming will help make the skin feel soft again. Apply dry and sterile dressings on the frostbitten skin. Avoid moving the affected area and keep it warm to prevent refreezing. 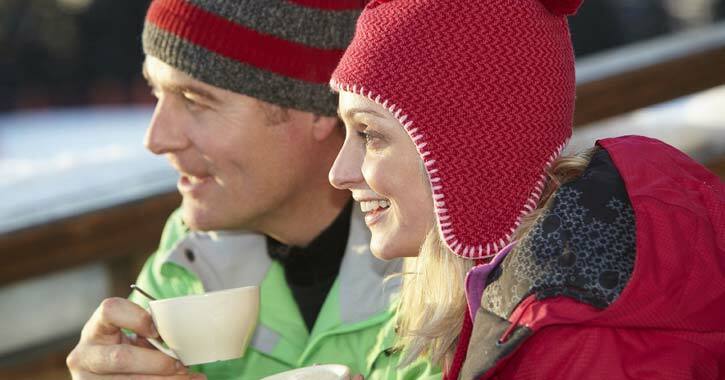 A warm drink can help you recover from frostbite and replace lost fluids. If you experience signs of superficial or severe frostbite, have increased pain, a fever, or other symptoms, then you should seek medical attention as soon as you can. Like frostbite, hypothermia is a cold-related medical problem. However, hypothermia is caused when your body temperature reaches very low levels, below 95 degrees F, as a result of exposure to the cold. Some common causes include being outside in winter without enough warm clothing on, falling into a cold body of water, wearing wet clothing, and not eating or drinking enough in cold weather. In addition, you are more likely to get hypothermia if you are very old or young, chronically ill, malnourished, fatigued, taking prescription medicines, or under the influence of alcohol or drugs. Similar to the treatment for frostbite, the first step is to get the person out of the cold and remove any wet clothing. Add warm layers (extra clothing, blankets, etc.). Start with the core (abdomen) and then move to the extremities (hands and feet). You don't want to cause rapid warming and shock. The person with hypothermia should remain in a horizontal position. If the hypothermia is serious and the person falls unconscious, then CPR may be necessary.